Figure 1. Summersweet in bloom; note the white flowers that vaguely resemble peppercorns. Figure 2. Range map of summersweet. Range: ​Summersweet can be found along the Eastern seaboard; as far north as Nova Scotia, south as Florida, and west as the eastern part of Texas. (Figure 2.) This is a relatively cold-hardy shrub, and grows well in zones 4-9. There has been some reported success with planting in zone 3, but it is not officially zone 3 hardy (6). ​Ecological Area: This shrub loves growing in damp soils. Summersweet can be found along the banks of rivers and streams, along the shores of both freshwater and saltwater bodies, and in moist woodlands or bogs (2). Common associates, particularly in the mid-atlantic region, include red maple, baldcypress, and water oak (3). Figure 3. Summer foliage of a summersweet not yet in bloom; notice the green obovate leaves with serrated margins and acuminate tips. Form: Summersweet is multi-stemmed shrub that typically reaches 4-8' in height, rarely exceeds 3'' stem caliper, and has an average spread of 3-5'. The shape is full and round (6). With horticultural use, summersweet is often hedged or used as a living fence. It has a tendency to sucker, so is prone to growth in colonies making it an ideal shrub for a border or perimeter (7). Foliage: This alternately branching shrub bears deciduous leaves 1.5'' to 4'' long and 1'' to 2'' wide. These leaves are obovate with serrated margins and acute to acuminate tips. They are green to dark green in color during the summer (Figure 3), and in the autumn they turn yellow-green to golden brown before falling off (4)(Figure 4). Life Expectancy: In their natural habitat and in rural areas, summersweet is a moderately long-lived shrub typically reaching roughly 150 years of age. When planted in urban areas and for horticultural use, lifespan is significantly reduced to around 30 years (7). Reproductive Details: The summersweet blooms in mid to late summer for 4-6 weeks, and the showy white flowers are esteemed for their beauty and sweet fragrance. These flowers can bloom in shady areas, making them desirable to add visual interest in shady parts of the garden. The flowers are perfect, containing both male and female parts, and are attached to racemes. The flowers bloom in upright panicles, and have a "spiky" appearance. In some cultivars, the flowers are shades of red and pink. When the petals fall off, they reveal the fruit; a small capsule. (Figure 5.) These capsules turn brown in the fall, and can persist for several years (4) (Figure 6). Figure 5. Summersweet fruit remaining on raceme after petals are shed. Figure 6. Summersweet flowers in bloom, notice the persistent brown seed capsules on the left. Soil: Summersweet grows very well in moist to wet soils, but has a low tolerance for drought. Neutral to slightly acidic soils are ideal. Summersweet thrives when there is an abundance of organic matter in the soil, and also often grows in sandy or clay soils (6). Though it tolerates heavy clay soils, soil amendments to improve drainage are recommended under these conditions (7). Light: One of the reasons summersweet is such a beloved ornamental shrub is its high shade tolerance. It does well under sun, partial shade, and full shade conditions. However, it should be noted that if planted in full sun, there is a higher risk of the shrub drying out (6). Ecological: An important ecological service that summersweet provides is attraction of pollinators. Bees, hummingbirds, and butterflies are drawn to the fragrant flowers (Figure 7). Additionally, because they are present near so many bodies of water and tolerate such damp soil, they play an important role in erosion control (7). ​Horticultural: Summersweet is a valued ornamental shrub for a variety of reasons. The upright panicles of white flowers that smell as beautiful as they look bloom in the late summer when many other flowering trees are done blooming, keeping landscapes visually interesting. Even when not in bloom, the shrub's compact form and dark green foliage make it an attractive addition to any garden, and it is especially popular in woodland, shade, and rustic cottage gardens. Another horticultural advantage of summersweet is its ability to form colonies and be pruned into hedges or borders (4) (Figure 8). There are various summersweet cultivars also of horticultural interest; these are mentioned in a later section. Figure 7. Butterfly visiting a blooming summersweet. Figure 8. Summersweet planted as a perimeter for a pollinator garden. Figure 9. A typical infestation of spider mites. Pest/Disease: Summersweet is not commonly affected by problems with pests and disease. However, in times of drought when the shrub is weakened, spider mites may move in and become a problem (4) (Figure 9). Site: As previously mentioned, summersweet are not drought-hardy, and will not be successful on dry sites. Planting from Nursery Stock: The guidelines for planting a young tree are as follows: dig holes that are 4x as wide and deep as the root ball, and be sure to not compact the roots. When shrub is placed in hole, fill first with water and allow the plant to absorb this. Then, fill hole with soil and more water, and apply mulch when finished (7). Figure 10. A peek into the process of propagating by cuttings. Pruning: The level of pruning this shrub requires really depends on the desired form. If a more natural form is desired, pruning can be limited to removing dead, weak, and broken branches in the early spring. If the rounder and more compact form is the goal, it is recommended to remove 1/4 of the plant's oldest and woodiest canes near the bottom of the plant in the late winter or early spring; before new growth begins. Suckers that shoot up around the base of the plant should be removed as well. To promote a bushier plant with more flowering tips, in mid-spring to early summer, the new growth can be trimmed back by 1/3. The pruning cuts should be 1/4'' above the bud and made at a 45 degree angle. If desired, the plant's overall vigor can be improved by "rejuvenation pruning," where plants are cut back to within a few inches of the ground in the late winter (5). Watering: During periods of drought, summersweet should be watered. Under typical conditions, regular watering is not needed. Figure 10. Botanical illustration of C. alnifolia. 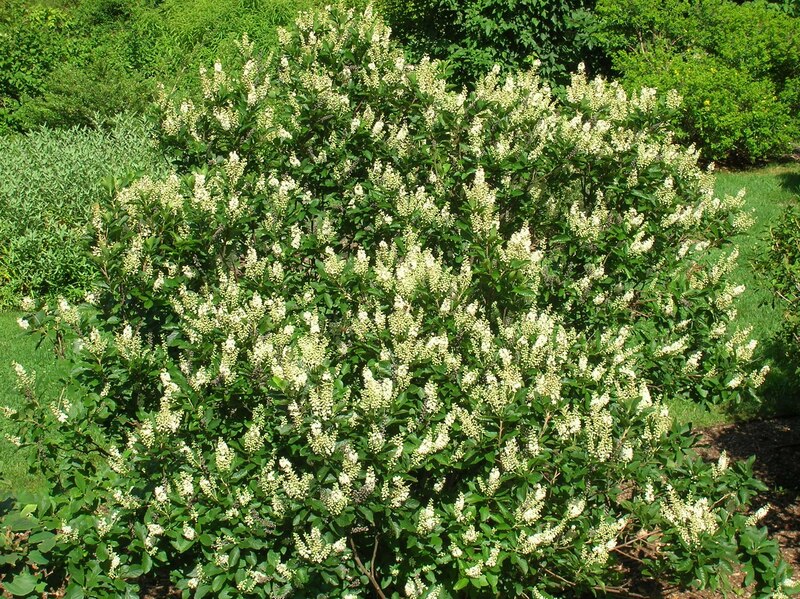 Many cultivated varieties, or cultivars, of ​Clethra alnifolia exist. Listed and briefly described here are the most commonly sold and planted cultivars (4). 'Ruby Spice' - The most common of the summersweet cultivars, 'Ruby Spice' blooms a beautiful dark pink color, which is especially prominent against the glossy dark green foliage. 'Hummingbird' - This is another very common cultivar, and is well loved for its compact growth, heavy flowering, and shiny foliage. It also has particularly beautiful golden autumn foliage. 'Anne Bidwell' - Noted for its slightly larger size, usually growing to about 6' in height, and its tendency to produce exceptionally large flowers, 'Anne Bidwell' is another popular cultivar. 'Pink Spires' - Buds are rose-colored and open to light pink flowers that do not fade. This is another cultivar on the taller side, typically reaching 8'. 'Rosea' - One of the first summersweet cultivars, 'Rosea' flowers open pink and gradually fade to white. ​Figure 11. 'Ruby Spice' flowers in bloom; notice the dark pink color. Figure 12. 'Hummingbird' in bloom; notice heavy flowering. Figure 13. 'Rosea' flowers; notice the light pink color.